The JSA/DMZ tour is one I have been looking forward to. Before booking our Asian holiday, we had intended to go on a tour of North Korea, getting a look inside the worlds most secretive country and seeing how accurate "The Interview" really is! When their borders didn't open (due to the Ebola outbreak) we gave up on the North Korea plan and decided to look at it from the South side. We specifically chose this Koridoor USO tour as it gave us the chance to technically go to North Korea. 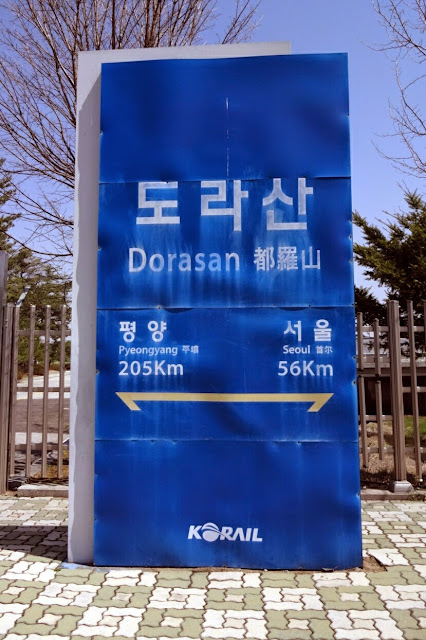 On the journey to Panmunjeom we faced more reminders of a country technically at war. There us a river that connects North and South Korea, due to its size it makes it suitable for invasions. As a result, the South Koreans have barbed wire down the length of the river, just after you leave Seoul city. There are also guards posted periodically along the river - this must be a really strong daily reminder for the locals and must be quite harrowing. Once we arrived we were given a debrief about the day and clued into a bit more about the history of the Joint Security Area or JSA. Whilst the debrief took place, we were asked to sign waivers in case the North Koreans attacked and there were any casualties. 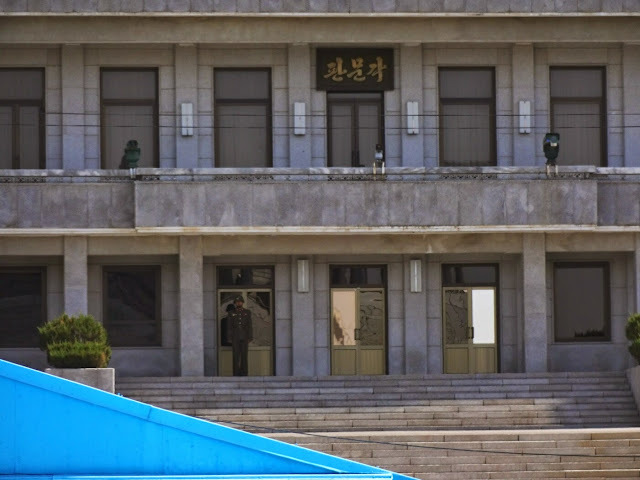 The JSA was designed as a place that North and South Korea could talk to make decisions and was where the current Armistice agreement was signed. The compound used to have several buildings all mixed together sitting directly on the MDL (Military Demarcation Line or the border). However, in 1976, the South were pruning a tree which blocked the view of another one of their buildings. The South took 13 men with them to do this job. Although the North were warned, they turned up with 27 men demanding that work stopped. When the South continued to prune the tree, the North attacked with the axes from the tree - killing two and injuring eight. This site is now called the Axe Murder Site. Following this incident the south cut the entire tree down with air support and ground support and it was decided that the MDL run through the JSA, stopping the soldiers from regularly coming into contact. This means that people should only meet within the buildings that are situated on both sides of the border. We were warned before walking out of the Freedom House onto Conference Row that the North Koreans would be watching us and that we needed to ensure we made no gestures towards them that could give them an excuse to attack. On conference row we were able to look directly into North Korean territory and at their opposing building. They had one visible guard stationed outside - Bob. There were, however, several North Korean buildings and outposts around us - this is where the observation was taking place. In front of us were a collection of buildings, blue (American) and silver (North Korean) where the previously discussed conversations could take place. Flanked outside were a row of South Korean guards who were there for our protection. They have bullet proof vests on and helmets. Their position around the building was such that if a fight broke out, gunfire would find it hard to kill them. We were able to take pictures of anything and everything on the North Korea side of the border. The border in the JSA is marked by 127 white posts spaced 10m apart. 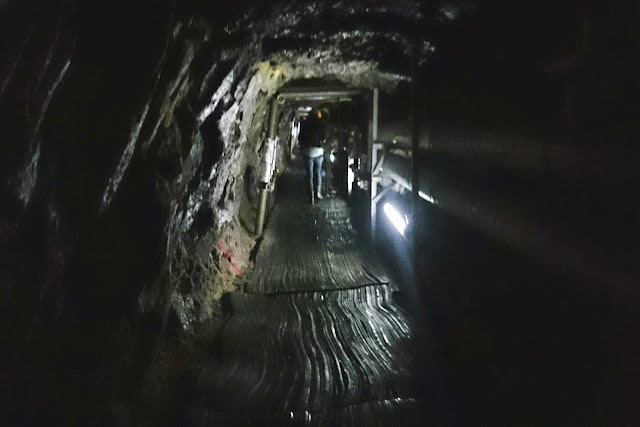 In the main JSA complex, a thick, raised, concrete slab ran across the border, signifying the two sides. The next thing we were able to do was to go into one of these American buildings. We stood around a central table, Matt and I on the far side, or in North Korea. 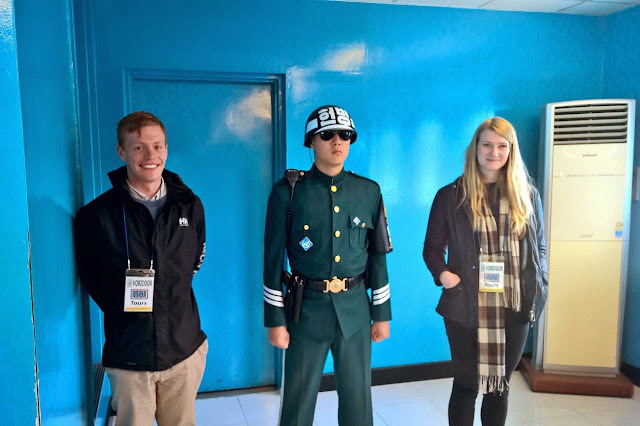 The solider then let us walk around the room and take photos with the ROK guards. We spent our entire time in the room on the North Korean side. Just past this complex was a viewing post approximately 30m from the MDL. From here we were able to see the Bridge of No Return, propaganda Village (Gilungdong) and the TSD village. From here we were able to directly view North Korean territory and were even able to see some tanks! At the end of the Korean War (1953), when the POW's were returned, they were taken to the Bridge of No Return. 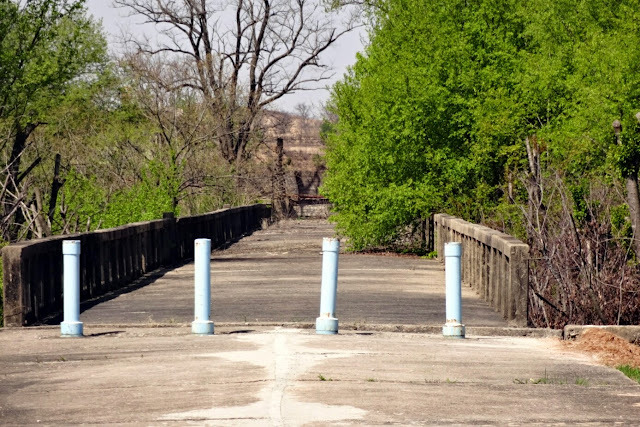 Here they had a choice, stay in their captive country or cross the bridge to their home. Once they made their choice they could never go back, hence the name. 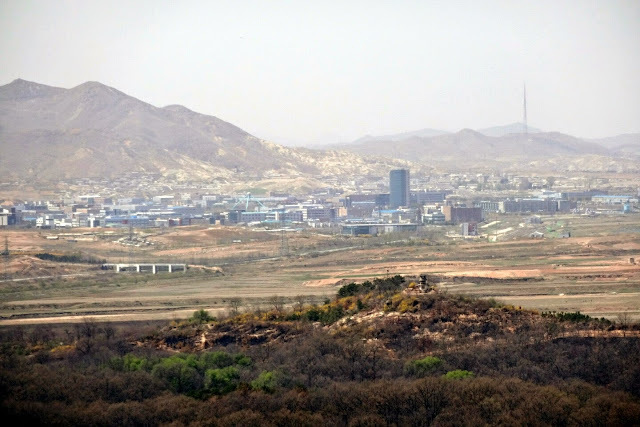 Propaganda Village is a fake village set up by North Korea. Until approximately 30 years ago, every night a loud speaker would play music and tell the South Koreans how great the North was, asking them to defect and join their Paradise village. Unfortunately, no one lives there, so defectors would be a little bit lonely. The village is home to the third largest flag in the world. 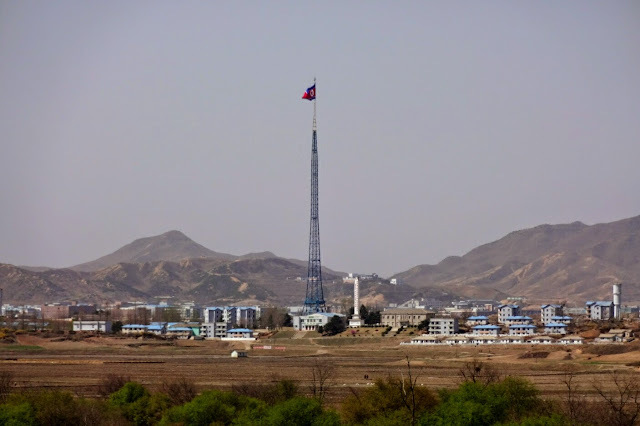 North Korea put a flag there when it was initially built. After the 1988 Olympic Games, the Olympic committee donated their flag to the TSD. This flag was larger than the North's. As a result, the North quickly responded by extending the flag pole 60m higher than the south's and raising a flag which weighs 600lbs. 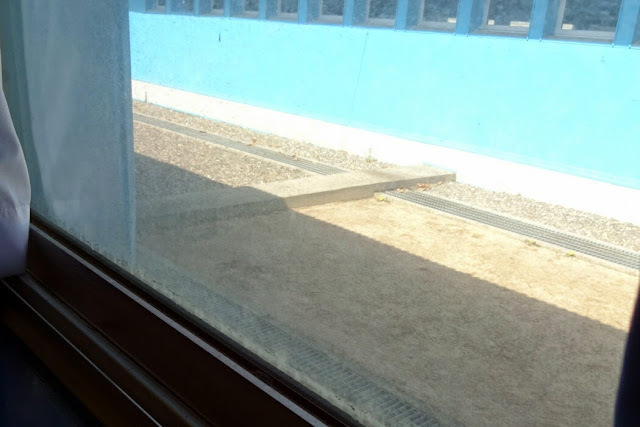 In the afternoon we went to the last train stop in South Korea. The next stop on this train line is in North Korea. The train line was damaged in the war, but repair works started in 2000-2002 when both sides were on good terms. From 2007, South Koreans could go on a tour into North Korea to see one of five famous heritage mountains using this line. Unfortunately during a tour in 2008, a North Korean guard shot a civilian woman and the North Korean Government refused to apologise. As a result the tour was stopped and the train hasn't gone past this station. We then visited the Dora Observation Deck - an old observation point for the South. From here (using the telescopes) we had a view of a North Korean village with actual people walking around! 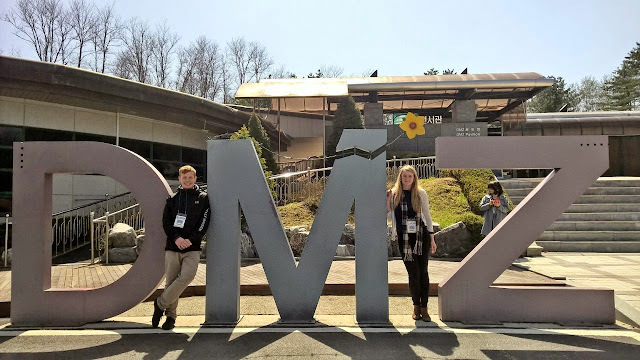 We also had a clear view of the width of the DMZ (Demilitarised Zone). Each side had to fence off a zone that was 2km away from the MDL. This zone should jot be entered - creating a 4km border between the two sides. Overall this day was very informative and provided lots more information about the entire situation than I could have expected. It also came with the massive advantage of being on North Korean soil.